Super Rhino! 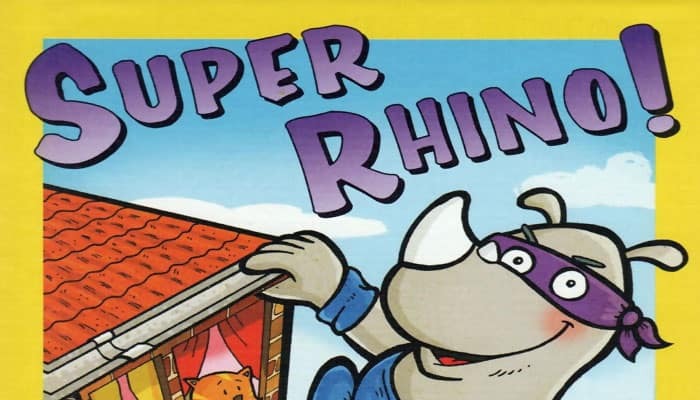 presents players with an incredibly heroic - and regrettably heavy - rhinoceros who is eager to climb a tall building and leap other tall buildings in a single bound. First, though, you need to construct that building. Each roof card bears markings that indicate where the next player must place walls on the card. In addition, some roof cards force a player to perform special actions, such as placing a second roof, changing the direction of play, or moving Super Rhino to a new location on the tower. Keep your hands steady! What is that? Is that a rhino climbing up the wall? Indeed! Rhino Hero is out and about again. The super hero from the animal world fearlessly scales the highest houses looking for burglars and rogues.